Quick access is a very nice feature of Windows 10, but only if you use it. If you do use it, it will keep the folders that you access most, at your finger tips. Quick Access is something like Libraries in Windows 7, only much easier to use and easier to understand. 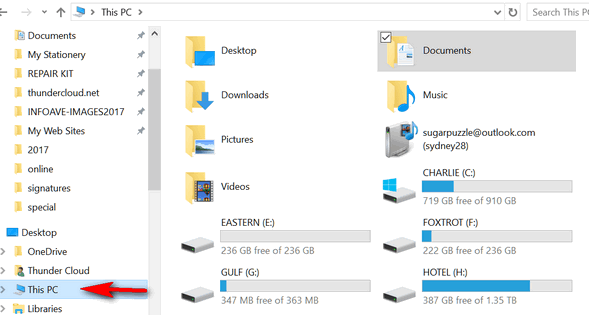 Quick access is a feature of Windows 10’s File Explorer. Windows File Explorer is similar to Windows Explorer that was in all previous versions of Windows, but has more features. And one of the best of those new features is Quick Access. 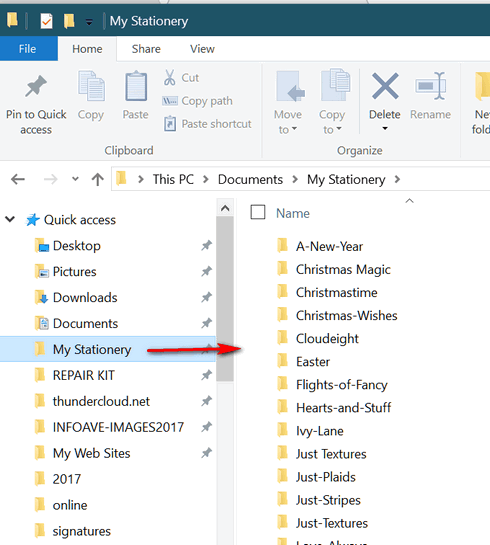 You can access File Explorer and its Quick access feature by pressing Windows Key + E, from your Windows 10 Start menu, or by clicking on the folder icon on your taskbar. You’ll notice in the screenshot below, on the left side,under Quick access, there’s a list of the folders I used most. As you can see I’ve added quite a few. You will also notice that the folders in Quick access are also listed under Frequent folders in the right pane. If you click on one of the folders under “Quick access” on the left, you’ll see its contents on the right. But wait, there’s more. You can add any folder, anywhere on you computer to the Quick Access menu. Above, I added my “User” folder “thunder” (from C:\Users\thunder) to my Quick access menu. All I had to do is highlight the folder I want to pin to Quick access, right-click it and choose “Pin to Quick access” or I can also click the “Pin to Quick access” button on the toolbar. You can see, above, as soon as I pinned the folder to Quick access , it immediately appears in the list under Quick access. 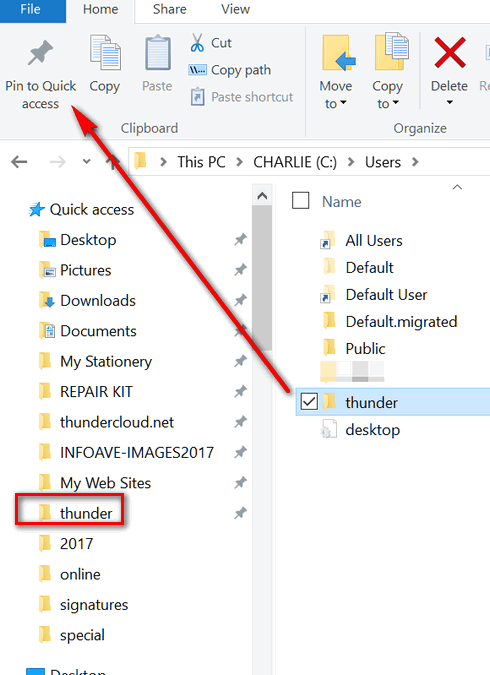 My User folder “thunder” is a folder I use very often… and now easy to access because it’s now pinned to my Quick access menu. It is instantly available from any File Explorer window. Should you need to navigate to other locations on your computer, click on “This PC”. 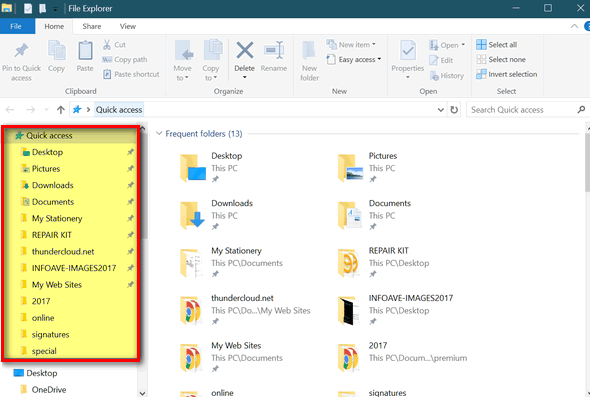 When you click on “This PC” you’ll see all your files, folders and drives and not just your most frequently accessed folders. Adding folders that you use often to your Quick access menu is a great way to save time and keep the folders you use most at your fingertips. And remember – you can pin any folder, anywhere on your PC, to the Quick access menu. Thanks for the reminder! I get so busy with so many things to do on the computer and forget about the little tricks and tips, so I’m glad you plop hints right in my mailbox every day. You perform a very valuable service for all!